Resistance takes shape in many different ways—in large, small, and everyday acts, and through people whose names we know and some people whose names we don’t know. How do you see yourself in Philadelphia’s resistance history? Would you have fought back against colonization? Been a revolutionary? Preserved your ancestral culture and traditions? Fed and clothed children in your community? Held hands in public with a forbidden partner? Stood against ratifying the 13th, 14th, or 19th amendments? We’d love to know more about your resistance story and how libraries and archives could be a partner in it. Your answers will help us figure out what’s next for Chronicling Resistance. Can you help us by answering the questions below? If you’d like to have us host a listening session with your organization, please fill out our contact form and send us a message. 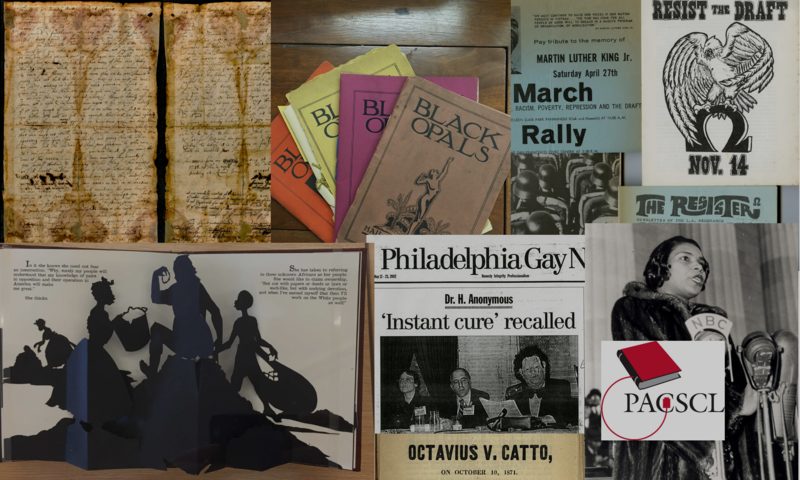 If you’re a PACSCL member organization looking for ways to spread the resistance narratives in your collections, tell us more here.